An artist's impression of WTC transportation hub, US. Who doesn't love an architectural icon? While rising prices and global uncertainty have slowed many building projects around the world – the ambitious Grand Egyptian Museum is once again on ice – eyes are open for key cultural offerings in Hamburg, New York and London. Sure, the skyscraper industry isn't going out of business any time soon – just take a look at the new Trump Towers going up in Vancouver, while skinny is inny as New York discusses the rash of slim skyscrapers overshadowing Central Park and the first super-tall skyscraper has been approved for Warsaw. However, take your head out of the clouds to see what's trending in the world of architecture. 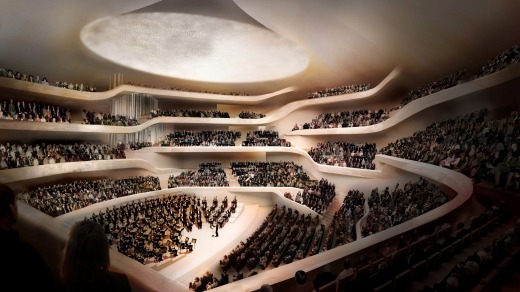 An artist's impression of lbphilharmonie concert hall, Germany. Should you find yourself near Sauda, in the Ryfylke region of Norway south of Bergen, seek out this new museum of the local 19th century mining industry. Maybe you're not a mining buff, but the real lure on the Aurlandsfjellet​ Tourist Route is this rustic museum by the architect's architect, Peter Zumthor. It's not his first Norwegian statement: the Swiss architect designed the Steilneset Memorial with Louis Bourgeois to commemorate a group of women who were burned as suspected witches in the 17th century. See www.nasjonaleturistveger.no. Abu Dhabi's Saadiyat Island is an architectural perv's playground in the making, with a Guggenheim and Louvre on the plans, with the world's biggest names – including Gehry, Hadid, Ando – at the drawing boards. Unfortunately, those waiting for architect Jean Nouvel's​ Middle Eastern Louvre will have to wait a little longer, as it's been postponed until "sometime in 2016". The knock-on effect is that Norman Foster's Zayed National Museum is also in the holding pens, with its 2016 date pushed back to the following year. So let's all just sit back and watch the latest Star Wars movie, which was shot in the country's Rub' al Khali​ desert, instead. See www.louvreabudhabi.ae. This list wouldn't be complete without a Hadid in here. For a cool $US50 million ($70 million), you can ensconce yourself in a futuristic penthouse by Britain's Dame Zaha Hadid, who makes her first foray into New York residences when her 520 West 28th Street apartments open this summer. Bucking NYC's current skinny skyscraper trend, Hadid's signature sweeps of sculptured steel and glass hug 39 apartments on an 11-floor condo, which is set beside another urban architecture success story, Manhattan's High Line park – so you can amble and admire if your wallet won't cough up. See www.zaha-hadid.com. It's been talked about for nearly 200 years, and finally this Washington DC museum dedicated to African Americans will open next September. Led by Ghanaian-British architect David Adjaye, who has described the three-tiered design as "a ziggurat that moves upward into the sky", more than half the building is underground, and the facade of the $540 million building is cloaked with a bronze-alloy lattice that echoes the metalwork designs by slaves in the 19th century. The Smithsonian's newest museum sits beside the Washington Monument. See www.nmaahc.si.edu. One of the world's most popular museums gets 70 per cent bigger when its 10-storey extension opens on June 17, 2016. Yes, the price tag has blown out by £45 million to a cool £260 million ($544 million). But the Swiss architecture firm, Herzog & de Meuron, which was also responsible for converting the original Bankside Power Station, defends the energy-efficient design, which includes brick lattice walls that will let the inside lights glow on dark London evenings. The original section also gets a lick of paint. See www.tate.org.uk. Bridge aficionados note: at 2.7 kilometres long, Scotland's Queensferry Crossing will be the world's longest three-tower, cable-stayed bridge. Ferrying traffic along the M90 over the Firth of Forth, near Edinburgh, its sibling, the Forth Bridge, was named a UNESCO World Heritage site earlier this year. Scotland has named 2016 its "Year of Innovation, Architecture and Design", with new galleries in the National Museum of Scotland and an architecture festival. See www.visitscotland.com, www.foa2016.com, www.forth-bridges.co.uk. 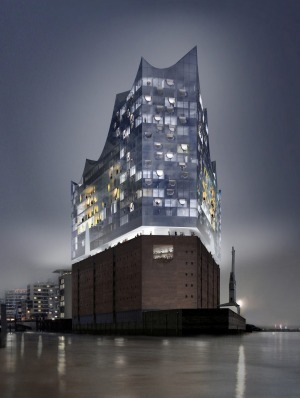 As the concert hall shimmers from 1100 glass panels and 6000 giant sequins, Swiss architect Herzog & de Meuron is wrapping up the project on Hamburg's Elbe river after 10 years on the job and a tenfold increase in its cost. Built over a 1960s warehouse, its 2100-seat grand hall, with its tent-like roof, is one of three concert halls, with a hotel and public plaza elevated 37 metres, affording 360-degree views. It will open on January 11, 2017, but the public can visit the $1290 million landmark from November 2016. See www.elbphilharmonie.de. Singapore gives its colonial past a fresh look as the new National Gallery, which incorporates the old Supreme Court and City Hall, becomes the world's first museum dedicated to south-east Asian art. The two buildings are linked by bridges and metal "trees" with a metal and glass canopy overhead. This is a sneaky last-minute entry, as the gallery opened its doors on November 24. See www.nationalgallery.sg. 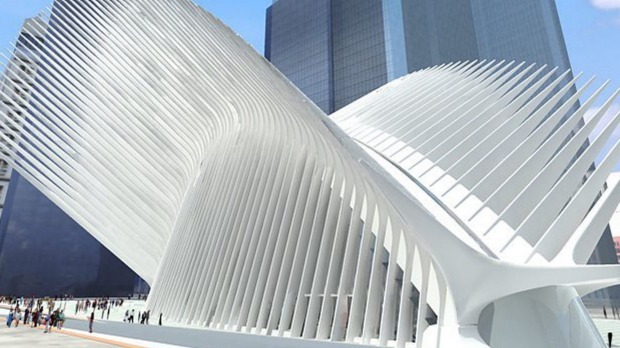 We flagged this project last year, but architect and engineer Santiago Calatrava​ still hasn't finished the much-delayed $5.56 billion World Trade Centre hub, where 11 subway lines meet ferries, railways and underground walkways the size of Grand Central Station. Set beneath the WTC memorial site in New York, the site is guarded by what's been dubbed the Calatrava "Bird in Flight", a sculptural oculus with 45-metre retractable wings. See www.wtc.com. An artist's impression of Len Lye Centre, New Zealand. Completed in 1995 by Mario Botta, SFMOMA is undergoing an extension by Norwegian firm Snohetta​ (which recently broke ground on the new Great Hall in the University of South Australia), doubling its exhibition space. Botta isn't enamoured of the extension, calling it an "enlarged wardrobe", but hopes the final 10-storey building, with its outdoor terraces and sculpture and vertical gardens blends with his original work. See www.sfmoma.org. Copacabana Beach gets a new star when this new museum by New York-based studio Diller Scofidio + Renfro opens in Rio in the coming year. The eight-storey access to the beachfront MIS will be from sloping, glassed-in walkways up its exterior. The design includes a rooftop restaurant that looks out to the ocean and, this being Rio, a nightclub. See www.mis.rj.gov.br. There's nothing subtle about this building by Dutch architects OMA. The most striking feature is a giant silver orb protruding from the main building, a shining cube which hovers over Taipai's footpath. The architects said they were inspired by a tempura food stand in the nearby night markets, for its ability to produce abundance in a tightly compartmentalised space. See www.taipeitravel.net:8080/en/. The Govett-Brewster Art Gallery, our neighbour's home of contemporary art, gets a shot in the arm with the new Len Lye Centre, dedicated to the work of filmmaker and kinetic sculptor Len Lye. 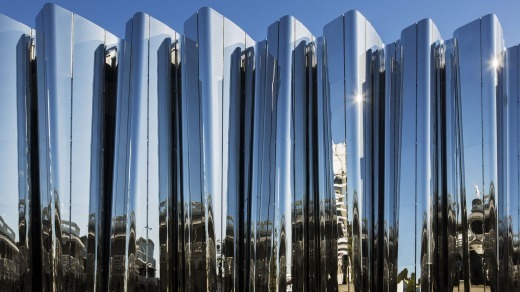 Located in New Plymouth, in the North Island, your prime camera angle is NZ architect Andrew Patterson's polished columns of stainless steel that glimmer in the afternoon light. The coming year sees the construction of a plaza around the building to play with the light reflections, opening early in 2016. See www.govettbrewster.com. Falling firmly in the "only in America" category, Noah's Ark is being built (again), this time in Kentucky, by a team of Amish carpenters. Sitting near the Creation Museum, Ark Encounter says its life-sized ark will be the biggest wooden structure in the US when it opens for 40 days and 40 nights from July 7, 2016. It will also have a petting zoo. Presumably with two of everything. See www.arkencounter.com. Architect Renzo Piano, he of London's Shard fame, turns his hand to a new opera house in a cultural complex on the Athens waterfront at Faliro Bay, four kilometres south of the city. The glass opera house and a new National Library of Greece are linked in what's being described as a modern-day Agora, the concept of a central meeting place that dates from ancient Greece. The project aims to be energy self-sufficient. See www.nationalopera.gr. 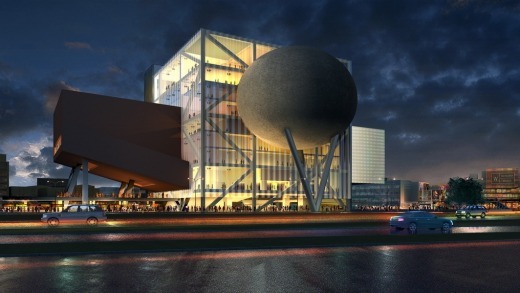 Taipei Performing Arts Center and Taiwan. The medieval "city walls" concept gets a seriously modern makeover in Milan's northern suburbs as starchitects​ Herzog & de Meuron​ finish an urban renewal project for the scholarly research group, the Feltrinelli Foundation. Twin walls made of great sheets of glass slope towards each other, mimicking their now-long-gone predecessors from the 15th century. See www.fondazionefeltrinnelli.it.